For the fourth consecutive year, Umpf picked up the award for Integrated Agency of the Year. In addition, our ‘up yours i quit” campaign for Multilotto.co.uk won Best PR Stunt of the Year. Umpf landed another three awards at the 2017 CIPR PRide awards: a Gold and Silver in the category for Regional PR Campaign of the Year, plus a second Gold for best Public Sector PR Campaign. We are delighted that our work with Park Inn by Radisson was a winner at the European Excellence Awards in Public Affairs. The INNovation Room campaign, which aimed to improve the guest experience through innovation, won the Travel & Tourism category at a ceremony in Brussels. 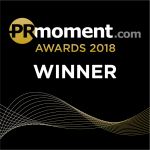 It was a hat-trick for Umpf in March 2017 at the PR Moment Awards, when we scooped Gold for Integrated PR Agency of the Year for the third consecutive year. We also took home Silver in the Best Use of Content category for our Trinity Leeds Real Deal campaign. Our ‘E-scapes’ campaign for Park Inn by Radisson won Most Innovative Marketing Campaign of the Year at the 2016 national Travel Marketing Awards in London. Umpf scooped three awards at the 2015 CIPR PRide awards, including the top award of the night: Outstanding Public Relations Consultancy. It also landed Gold for Consumer PR Campaign of the Year and Silver for Best Social Media Campaign. It was three trophies at the Northern Marketing Awards in Manchester: Best Small Agency; Best Tourism & Leisure Campaign; Best Social Media Campaign. Umpf picked up its second Social Media Agency of the Year award in 2015 at the UK Social Media Communications Awards in London. Umpf was named the Best Small Social Media Agency in the UK. Umpf was a finalist in the Innovation category at the national Chartered Institute of Marketing Excellence Awards held at the Grosvenor House Hotel in London. The CIM’s Professional Marketing Standards recognise ‘creativity, originality demonstrable results’. Our work for East Coast (now Virgin Trains East Coast) won Best Overall Use of Social Media at the inaugural Social Travel Britain Awards, which honour the top social and digital marketeers in tourism in Britain. Judges said our campaigns were “innovative” and “ground-breaking”. Umpf was crowned Social Media Agency of the year and Integrated PR Agency of the Year, as well as picking up Best Use of Evaluation at the PR Moment Awards in Manchester. Umpf landed two gongs at the Northern Digital Awards: Best Sports Digital Marketing Campaign and Best Low Budget Campaign. Three awards (two Gold, 1 Silver) for Umpf at the CIPR PRide awards – Best Use of Media Relations for our Bupa Winter Wellness campaign; and Best Use of Social Media for Belling/BBC Good Food Show (Gold); and East Coast Trains (Silver). Another social media award for Umpf. This time it’s Best Use of Research and Evaluation at the UK Social Media Communications Awards. Our Sports Social Media Index campaign won the Most Innovative Product award from Corp Comms Magazine at their annual Digi Awards held at the Museum of London. Umpf scooped the Digital Marketing Campaign of the Year at the 2014 Chartered Institute of Marketing Northern Conference and Awards for our multi-award-winning Sports Social Media Index campaign. Shortlisted alongside agencies and brands from Beijing, Chengdu, New York, Hong Kong, Umpf won three international awards – a Gold, Silver and Bronze – at the 2014 AMECs (the international Association for the Measurement and Evaluation of Communication) in Amsterdam. Umpf is named amoung the Top 50 PR agencies in the North of England by Prolific North. The agency was ranked 29th in the independently-published league table. Umpf was a double Finalist in the national CIPR Excellence Awards 2013. Following up our success in 2012 (winner of Best Social Media Camapign), we were Finalists in the best Consumer Relations Campaign category, as well as Outstanding Small Consultancy. Top Three PR Agencies in Yorkshire. PR agencies across the region were asked to vote for their favourite agencies in the annual Insider magazine PR League Table. Umpf was voted in the top three by our industry peers. In March 2011, Econsultancy revealed its list of the Top 10 Social Media Agencies in the UK. Umpf was ranked in the list which was compiled by Econsultancy CEO Ashley Friedlein.